Remember to check the end of the post for your free downloadable notepaper ! Isn't it just..................it's my day off with littlegob and we usually go swimming but today we hung out in the garden and I thought well I should really share it with you "gobbies" out there as my garden happens to be where a great deal of the inspiration for our stuff comes from. It's a really old garden, well for Perth it is, about 60 yrs old and contains the original hibiscus and mulberry tress and gum trees and Jacranda and on it goes. I need to add that it is winter here in Western Australia but check out those stunning blue skies. 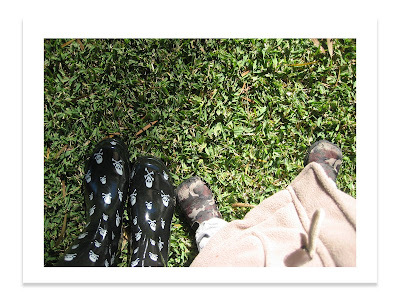 Oh and how about my $20 pirate wellies Janine's littlegob will be so jealous. 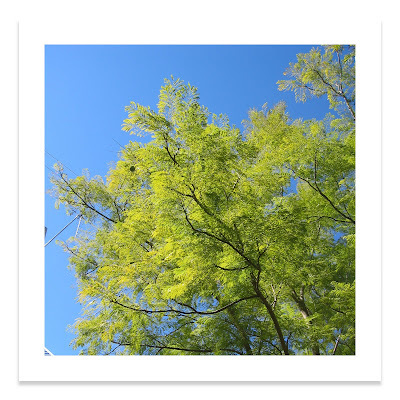 This is one of our old Jacaranda trees and my tin roof. 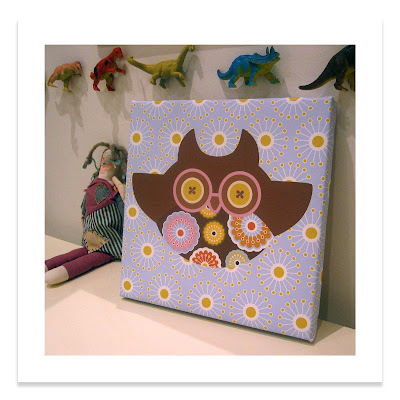 Our small Emmas Owl canvas in littlegobs room. These are available on the website $95 AU (without postage) but if you are interested let us know here you are and we can work out postage. Drum roll please..........................This weeks freebie download...................for all of those who go to notebooks anonymous like me (I have way too many notebooks) and need to write down all the things they need to get, do, finish etc here is an A5 (half a sheet of A4) piece of designed notepaper with Emmas Owl (in blue) on it. Feel free to dowload, print and scribble away on, as usual don't try to sell them and I would love to know who downloads them and what exciting things you might write on them.............I'm very nosy. Just click on the pic below and it will take you to the large image, print it out actual size and snip around the outside dotted line for super duper notepaper. Enjoy! Anytime you can sneak in more pics of your garden? I love catching glimpses of people's backyards especially when they are located in far off lands! And thanks for the very cool download! Your designs are so awesome! Thank you for this very cute download! 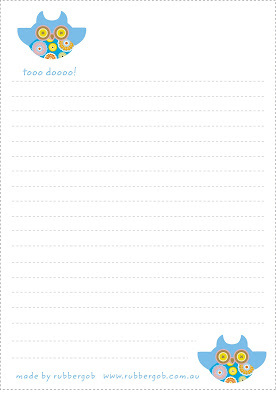 This stationary was so cute I just had to pass it along, I posted the link on my site, www.kidsstuffworld.com . So cute ! Thanks so much for this lovely freebie ! Thanks, the to do list is adorable!